Monarchs in the Joseon Dynasty of Korea are descended from Emperor Taejo of the Jeonju Lee lineage. Joseon Monarchs ruled Korea for 500 years from 1392 until 1897. In 1897, the name of the country was changed from Joseon to the Korean Empire, and was ruled by Emperors continuing in the same lineage until the Empire was dissolved in 1910, at the time of the annexation of Korea by Japan. This genealogy shows the line of succession from the founding monarch Taejo of Joseon down through Gojong, the Joseon Dynasty's last king. Only direct descendants in the paternal line are shown in the genealogy, and sons who died in infancy are omitted. Legitimate sons, the sons of Queens, are listed first, in boxes outlined in blue, followed by sons of concubines, listed in order of their date of birth. A military leader in the waning days of the Goryeo period, King Taejo of Joseon was no longer a young man when he established the Dynasty, taking over the throne from the last Goryeo monarch, Gongyang, in 1392. In 1398, after just six years of rule, Taejo, disheartened by the fighting between his eight sons, turned the throne over to his second son, King Jeongjong (the eldest had already died). Taejo was posthumeously given the title Emperor by Emperor Gojong in recognition of his contribution as founder of the Dynasty. Many of the other early monarchs of Joseon had relatively short reigns, ascending the throne when they were already rather advanced in age. The first nine monarchs of Joseon collectively ruled for about 100 years, with King Sejong the Great ruling for the longest time, 32 years. King Jeongjong's reign was even shorter than his father's, lasting only two years before he resigned in fear of retaliation from his younger brother, who already killed several nobles and his younger half brothers, whom he perceived as obstacles to his taking the throne. In spite of his ruthless actions in attaining the throne, the younger brother, King Taejong, who ruled much longer than his father or brother, holding the throne for 18 years, accomplished a great deal toward establishing a strong foundation for the Joseon kingdom. Taejong passed the kingdom in good condition to his most able son, King Sejong, who went on to be Joseon's most successful monarch, ruling for 32 years, and further strengthening the young dynasty. 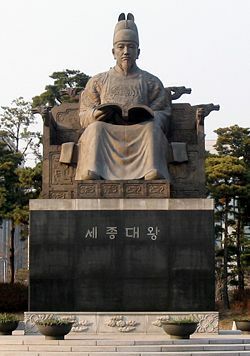 A lot of the momentum he built up was lost in the series of short, less successful reigns followed Sejong: his 1st son, King Munjong was Joseon's 5th king, but died after only two years, and was followed by his son, King Danjong, who took the throne at age 12, with a council of Ministers to help him reign. After only three years, the ministers were assassinated and Danjung was forced from the throne by Sejong's 2nd son, King Sejo. After his bloody ascent to the throne, Sejo ruled successfully for 13 years, leaving behind a legacy of improvements. His eldest son died before him, so at his death, the throne passed to his 2nd son, King Yejong, who was not yet 20, and his mother Queen Jeonghee, become Joseon's first female regent. When Yejong died less than two years later, his oldest son was only three years-old, so the throne passed to his nephew, King Seongjong, the son of King Sejo's first son Deokjong, who had died before he had a chance to take the throne himself. Queen Jeonghee continued as regent for Seongjong, along with his mother Queen Insu. After seven years of regency, Seongjong ruled almost two more decades in his own right, a reign marked by progress and prosperity. His father was given the posthumous title King Deokjong in recognition of role as the father of Seongjong in light of his son's accomplishments. Following Seongjong's reign, the next six Joseon monarchs ruled for a period of 150 years, most of them staying on the throne much longer than the early Joseon monarchs, characterizing the middle years of the dynasty with a sense a security. When King Sejongjong reach the end of his life, he had to choose an heir. Of Seongjong's many sons, only two were the sons of queens. One of them, Jungjong, was only six years-old when Seongjong died, so the throne went to 18 year-old Prince Yeonsan (Yeonsangun), the son of a concubine who had become queen shortly before the Prince's birth. Yeonsan proved a violent monarch, seeking vengeance for the death of his mother who had been exiled and poisoned by rival factions at court, and after 12 years he was removed from the throne and replaced by his half-brother Jungjong, whom everyone in the court recognized as the son of a full Queen. Because he was deposed, Yeonsan was stripped of the title King, and given only the rank of prince. At the same time, Yeonsan's son, Crown Prince Hwang, became ineligible for the throne when his father was deposed, so the line of succession moved to a different branch of the family. 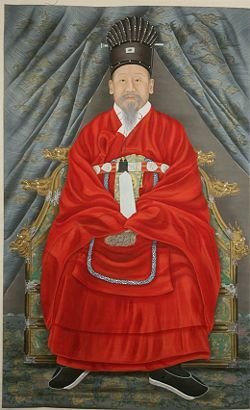 King Jungjong held the throne for a long time, reigning for nearly 40 years. Jungjong was succeeded by his first son King Injong, who reigned only a year and died without an heir, and then his second son, King Myeongjong, who ascended the throne at 12, with his mother Queen Munjeong as regent. Although King Myeongjong held the throne for 22 years, Munjeong did not give up control when her son reached the age of 20, and he was over 30 before he she died in 1565, giving him a chance to rule on his own. He died two years later, and his only son had already died, leaving him without an heir, so he was succeeded by his nephew, Seonjo, the son of his youngest brother, Prince Deokheung. King Seonjo's 41 year reign started out well, but as time went by, he became greedy and corrupt. Toward the end of Seonjo's reign, he entrusted a lot of responsibility to his two eldest sons, Princes Imhae and Gwanghae, sons of one of Seonjo's concubines. Gwanghae ran the country while Seonjo fled to safety during the seven years of war with Japan under Hideyoshi. Feeling that Prince Gwanghae had more leadership ability than his elder brother Imhae, King Seonjo directed that Gwanghae should succeed him to the throne. This decision was opposed by the Chinese Emperor, who had some control of Korea throughout almost all of the Joseon Dynasty, and felt that the oldest son, Imhae, should succeed Seonjo. There was also opposition to Gwanghae from elements in the court who felt the crown should go to Seonjo's youngest son, Prince Youngchang, the only Prince whose mother was a Queen. Seonjo's wishes prevailed, and Prince Gwanghae ascended the throne and ruled for 15 years, and ruled with skill, but the controversy surrounding his succession eventually caused him to be deposed and replaced by his nephew King Injo, the son of Gwanghae's younger half-brother Wonjong (Prince Jeonwon). Like Prince Yeonsan, Gwanghae was not given the title 'King' because he was deposed, and is referred to as 'Prince' (Gun), the title of Crown Prince was taken from his son, and the line of succession passed to his brother Wonjong's line. King Injo did have support from the political factions surrounding the throne, which gave him a measure of stability at home; however, his reign was marked by invasions by the Qing Chinese, who took his two sons to China as hostages. In China, Crown Prince Sohyeon became a Christian, and when he returned to Korea in 1645, his Christian faith became a matter of conflict with his father. Crown Prince Sohyeon was found dead under suspicious circumstance, and his younger brother became Crown Prince, and eventually king. King Hyojong strengthened the military and maintain the Qing Chinese as allies, helping the Chinese to fight against Russia. Because he invested a lot of resources into the military, he was relatively unsuccessful at improving other areas of the kingdom and died at age 41, exhausted by the strain of running the country, after only 10 years on the throne. For three generations following Hyojong, his descendents held the throne for long reigns, his son, [Hyeongjong of Joseon|King Hyeongjong]] ruled for 15 years from 1659-1674, followed by King Sukjong, who ruled for 46 years from 1674 until 1720. Sukjong was succeeded by his first son King Gyeongjong, who died after only four years, and was followed by Sukjong's second son, King Yeongjo, who had a long reign of 52 years. During his reign, [Yeongjo of Joseon|King Yeongjo]] outlawed the Catholic church, leading to a series of persecutions and the martyring of many Catholic faithful in Korea during the upcoming decades. Otherwise his reign was unremarkable except for the very tragic situation with his son, Crown Prince Jangjo, who is often referred to by his birth name, Prince Sado. Sado was mentally unstable, and Yeongjo felt it was not possible to allow Sado to take the throne. After his behavior became more and more violent, Yeongjo had him imprisoned in a large rice box for about a week until he died. Yeongjo was then succeeded on the throne by Sado's son, King Jeongjo. Despite the heartbreaking situation of his father's death, Jeongjo ruled very successfully, instituting reforms and gaining a reputation as a visionary forward-looking king. He also built Hwaseong Fortress, in the Suwon area, to honor his father's memory. In many ways, Jeongjo was the last effective king in the Joseon Dynasty. When his reign of 24 years ended, he was followed by his son, King Sunjo, who took the throne in 1800. Sunjo took the throne at 10 and ruled for 34 years. Sunjo was succeeded by his grandson, King Heongjong, who also took throne at a young age, being only eight when he ascended, and his grandmother, Queen Sunwon served as regent. Heongjong, in fact scarcely ruled at all, as Sunwon refused to give up control even when Heongjong came of age, and when she died, control passed to others in her family. Sunwon and her clan continued the persecution of the Catholics, eventually drawing an angry response from the French. Heongjong died without an heir, the line of succession was broken, and the throne passed to a distant descendant of King Yeongjo, King Cheoljong. Like Heongjong, Cheoljong's reign produced no appreciable progress, nor an heir. When Cheoljong died, the search for a successor went ever further afield, to a 9th generation descendent of King Injo, producing to King Gojong, the last Joseon King. Though he had a long reign of 44 years, Gojong left behind very few tangible accomplishments. This was due to a number of factors. 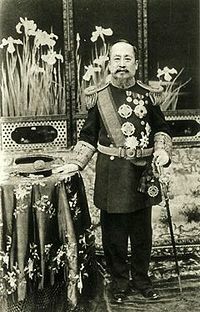 Gojong took the throne in 1863, ruling during a time when counties all over the world were making the transition from monarchies to various forms of constitutional governments, because the world was becoming more complex and it was no longer practical for a monarch with a handful of advisers to manage a country's foreign relations; a larger government structure was needed. Gojong's course was further compromised by having ascended to the throne at a young age, which meant he did not rule directly; his father, Daewongun, controlled the throne during the early part of Gojong's reign, and later his wife, Queen Min, and her clan gained much of the control. Queen Min was murdered in 1894, reportedly by the Japanese, and in 1897, Gojong declared that Korea was an empire, and he ruled as Emperor of Korea for 10 years before being pressured by the Japanese to step down in favor of his son, who became the empire's 2nd and last monarch, Emperor Sunjong. Three years later, in 1910, the Japanese went one step further and annexed Korea, declaring and end to the Korean Empire. Gojong's descendents set up court in exile, but never regained the throne. Some members of the former royal family still survive. History of "Genealogy of Joseon Monarchs"
This page was last modified on 25 May 2017, at 16:30.